You may be one of the unfortunate ones who were unfortunate to cross roads with a psychopath. If you’re fortunate, you were only temporarily targeted by the psychopath, and were used (possibly abused or picked-clean) then discarded like yesterday’s trash. Psychopaths excel at blending-in with society and they permeate all walks of life. You may encounter them at work, in religious organizations or you may find yourself in an intimate relationship with one. 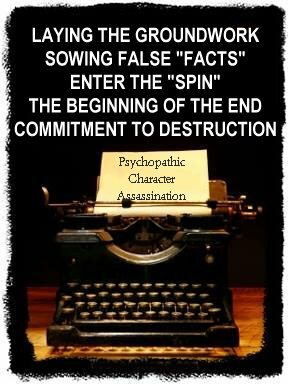 Some people are lifetime targets of Psychopathic Character Assassination (Psyca) a full-on unbridled attempt by the “Path” (used interchangeably to represent either a psychopath or sociopath) to totally destroy any credibility that the unsuspecting victim may have had. What makes this victim so special over the other victims, that they are targeted to be the recipients of a possibly life-long dedication to end all normal social interaction or positive human connection with other inhabitants of our planet? Simply stated, in most cases, victims of Psyca normally self-select by knowing too much about the Path. Paths routinely maintain at least two separate personas. One, a positive, gregarious, revered personality that is embraced by unsuspecting society, the other is their dark Path self: their evil twin. They may have many other personalities that they dial-in at any particular moment to manipulate their current audience (not to be confused with multi-personality disorder because they change personas at will with the intent to defraud). It is imperative that the Path keep their dark sides hidden from the general populace. Think about it; if anyone knew who they really were, their lives would crumble. To the Path, protecting the secrecy of their true innate evil is as important to them as anything that provides life or sense of purpose to any other normal human being. Paths usually launch their Psyca-attacks following a very calculated formula. Even though there is no known, “playbook,” that has been published for the Paths to follow, they all intuitively use the same system to ruin the lives of those who they feel may be a threat to the sacred secrecy of his or her true self. Certainly, making a potential witness appear to be a crazy, mentally disturbed, narcissistic sociopath, psychopath or pathological liar is the logical solution. Years of research and experience has concluded that usually within the first moments of engaging with a victim who might have access to too much personal information on the Path, they begin to sow the seeds of doubt and lack of trustworthiness behind the victim’s back. The Path draws in the friends, family co-workers and acquaintances of the victims with his or her personal charm in an effort to build a (false) trust relationship with the fringe audience. This is accomplished with little effort as the Path has innate skills that easily manipulate the perceptions of others endearing them to him or her as they wield their persuasiveness and charm. The initial impact, though appearing quite harmless and innocuous is commonly cloaked in the appearance of sincere concern for the victim’s well-being and might sound something, like, “I don’t know if you’ve ever noticed, but have you ever thought that (insert victim’s name) may not be what he (or she) appears to be?” No accusations, no data, reports or inclinations of anything concrete, just tilling the soil and fertilizing it with a little doubt. All the while, they are increasing their own credibility with someone who may be a family member, friend, co-worker or acquaintance of the intended victim; unaware that they are being groomed as the Path’s minion who will be turned against the victim when the time is right. Grooming from this point forward will take a secretive slant and will likely be presupposed with something, like, “Don’t tell (insert name), but…” as they actually sow seeds of doubt. As the relationship between the Path and his minion(s) grows deeper, more and more seeds will be sown in an effort to cast doubt, while the victim is none the wiser. I’ve always thought it peculiar, that in most cases, these once close associates of the victim rarely, if ever, courteously approach them with the sensitive information with a sincere, “Hey, I was just wondering about (insert reports of lack of sanity, trustworthiness, a secret double-life, illicit drug-use, illegal activities, pathological symptoms, etc…)…” that would definitely be an early indicator that something was up. In most, if not all, circumstances the victim continues to navigate their life’s journey unaware that the world they once enjoyed is being eroded or destroyed behind their back. Why? Because no one knows these attributes better than the Path. They are the undeniable expert in these pathologies and they know how critical it is for someone who has them to keep them a secret in an effort to appear to be normal. In no way am I suggesting that the Path might limit their Psyca-attacks to their own attributes. They are extremely acute at the skill of taking a known truth and spinning it into a ludicrous conclusion that will cast a dark shadow on anyone at any time. Paths have the ability to spin any factual data into an amazing story that will breed conspiracy or contempt for any individual at will. For instance, let’s say that you had a hard day at work all day, due to struggling with an intense ongoing headache. Everyone at work could tell that you were not “on your game” as usual. If you intimated to the Path that you had a headache; that would give them the data that they needed to spin a tale. No matter what you say or do, you cannot prevent the Path from spinning it into a negative story about you that will erode your sense of normalcy. When the Path has a clue that you are coming to the end of your usefulness in the accomplishment of their goals, he or she ramps up the defamation, usually making it appear that it is you who is beginning to attack them. At this point the Path will appeal to their minions’ sensibilities as they present themselves as the sacrifice, martyr or victim of your psychotic manipulations. It will become apparent to you when your relationship with the Path is coming to an end, that there has been a definite polarity has taken place. People who were once your friends will drift away… and you will notice a gravitation toward the Path. Having no internal filter, they will stop at nothing in an effort to humiliate you. They will spout vile accusations, even proclaim you’re mentally ill, if it will support their proclamation that you cannot be trusted or are inherently evil. Trying to defend yourself is almost pointless. If the Path is quite proficient – as most of them are very accomplished – anything that you say in your defense will appear to be a part of your psychosis and will strengthen all of the groundwork that the Path has laid in preparation of this moment. Even if the Path’s relationship with the minions begins to dissolve (as it almost always does when the Path moves on in search of new victims and minions), the seeds will always leave a mark in their minds… and as heartbreaking as it may be, in most cases, regardless of the ultimate outcome of the Path’s lifestyle, there may be no hope for recovering the life that you once knew. Jobs and careers may be lost, friends will turn their backs on you, family members will distance themselves, the people that you once trusted with your most intimate thoughts and feelings will always wonder who you “really were” all the time they knew you. There is no way to anticipate how long the attacks will take place. In some cases, if the Path is the least bit concerned that you might at some point discredit them or tarnish their appearance or reputation… the attacks will continue. If the Path believes that at any point you could be a threat to their charade, the spinning will not cease. This perceived threat may continue until either of you cease to be. Many Paths have come right out and made bold, public declarations that they, “will not rest until you are,” locked up, put away, homeless, or dead. Paths may even go as far as to manipulate the media. In many cases a Path may launch a character assassination media campaign in an effort to make certain that you will have little or no credibility whatsoever. Media campaigns may include radio shows, newspapers, magazines and social media pays quite effectively into their slanderous toolbox. If you are active in social media, it is not very hard to tap into your network, and start spinning your friends, followers or associates against you as they spin everything you say or do against you.